Currently doing stuff in regards to it. It's a bit like FTL crossed with Roll to Dodge. I think you guys will enjoy it. Tried to make it as player friendly as possible while ensuring it's easy to update too. Instead of writing what happens after each post which is pretty time consuming, players will get events from a set list and they get so many events per day. Many of the events have references to the other games. I do want a hot doge suit of course to somehow be implemented. I'm guessing you meant for the picture to be unreadable? (2019-01-31 09:31:39)Dootany Wrote: I'm guessing you meant for the picture to be unreadable? Yes, but I'm sure someone has the superhuman power to read heavily compressed stuff. Still working on it, rebalancing the events atm. I spent a good five hours writing events yesterday. Just to show you all why it's taking so long for me to finish up. You need to understand there are many events currently designed and these often have 2 or more text segments that need to be written. Right now the way I have designed this is that each player operates independently, hires "crew", then chooses an expedition from a list to embark on. Each day they progress through x number of events. Crew will function as your life total in a way but they also help the main 2 stats which are pewpew for power based stuff and lore for fedora-flip stuff. Players can opt out of an expedition for no penalty if it's going badly when the update lands. It sort of takes the best parts of RtD, the lore and exploration of the unknown, the randomness and that sweet, sweet hit of learning what happens to you each day. Some events just play out with little variation, others will make you roll your pewpew or lore stat against a target number, which is also how combat plays out. A few events change based on circumstances such as a legendary creature being slain or you having a skill or item that benefits you in some way to get better rewards on the events. Anyway enough rambling. Here's some teasers as for the lore quality I'm going for. A Spawnling blocks your path, an artificial thing composed of dark grey hues of metal plating. A mockery of a housecat and it’s as small as one too. Red, soulless eyes stare past you and your group before the rubber of its lips peel back to show off its dagger-sharp metallic fangs, it’s a growl without sound, but just as menacing. Legend has it that these machines were once part of a great hivemind and in its absence they have turned feral, chaotic and it proves this perfectly when it suddenly charges forward, fangs, claws and all. It’s impossible to predict, unlike any machine ever created, it lunges and dodges with reckless abandon, many blows exchanged, many of them parried away, sure blade to deadly claw and vicious fang. It lunges for you now after tumbling into a blind spot in your vision, but a crew member grabs a rock and slams it down onto its head. It drops squat instantly after, sparks flying, servos whirling. It fidgets in its death throes just like a living animal, morbid, but that doesn’t stop you from grabbing an axe to decapitate the vile tempered thing once and for all. **SUCCESS** Your Pewpew roll: X Target’s Pewpew: Y. You have gained Z credits. The Spawnling barrels towards you at such a high speed that it catches you all by surprise. The first strike of those deadly, deadly fangs is parried away by steel from a blade, yet with feline elegance it lands surely and commences the attack once again, leaping sidelong into a surprised crew member. It latches onto his chest, claws stabbing in to anchor itself, drawing blood, before the fangs come in to strip not only the clothing, but flesh and bone from the rib cage itself too. Blood gurgles out like an erupting geyser. It happens so fast. As the human falls to the ground the artificial cat beast snarls at you and only you, no sound, just those bloody fangs and piercing red eyes.You all charge in, weapons at the ready, but it scampers off, leaving you with the dead carcass of your former companion. **FAILURE** Your Pewpew roll: X Target’s Pewpew: Y. 1 Crew member has been killed. Your expedition takes you past a rocky outcropping that looks distinctly like a majestic stallion rearing up on his hind legs like an uppity beast. One comment leads to another among your crew and soon the horse puns are unstoppable and all consuming. Twenty minutes of cheesy and unrelenting horse puns. You almost wish you had brought some headphones with you until someone apologises. Sort of. “Hey sorry guys, I mustang out with the wrong people!” That’s the pun that gets most of the crew rolling about on the ground with laughter. You roll of your eyes and lead them on, jabbing the toe of your boots against their ribs when you pass them. At least they seem happy for now. Morale has risen by 1 stage. 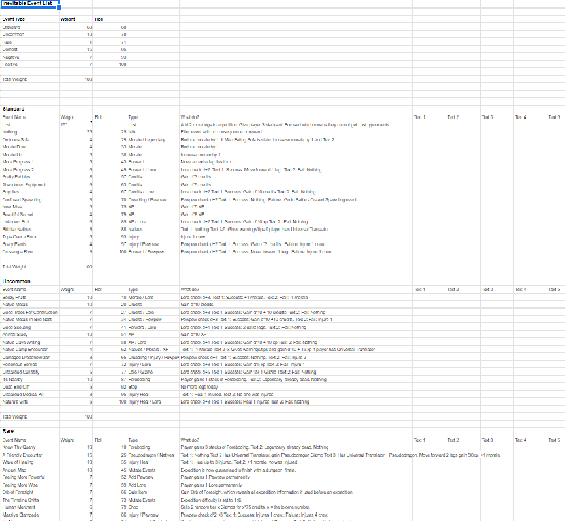 Got 37 events left to write, it's taking a while, but I'm still progressing nicely. Skrilly is helping writing a few of the events. So likely this will go faster. Been all sniffly with the flu so this will take a bit longer. Current time: 2019-04-21, 10:16:26 Powered By MyBB 1.8.5, © 2002-2019 MyBB Group.